Medal of Honor Recipient PFC Frank P. Witek Memorial Park is a 144 acre park on the east side of the city on property that was formerly a reservoir. It was one of the earliest settled areas of the city dating back to the 1600's. In 1859, the burgeoning Borough of Derby on the west side of town needed a stable water supply and the Birmingham Water Company bought the land in the area which was mostly meadows and farm land. 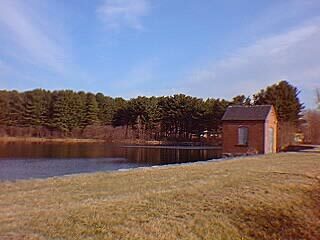 They dammed the brooks in the area to create the reservoirs which they continued to own and utilize until selling it to the City in 1997. 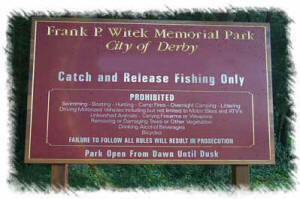 On May 29, 1999 the city dedicated the park in honor of PFC Witek. In addition to two beautiful ponds, the complex also contains trails for walking and hiking. On September 16, 2006 the City officially opened two new soccer fields on part of the property. Click here for more on that ceremony. Permits are no longer required for the use of the park, but they are required for use of the soccer fields. Please enjoy the beauty of the park and respect the posted rules for use. PFC Frank P. Witek The City of Derby officially dedicated the former water company property in memory of PFC Frank P. Witek who received the Medal of Honor for his bravery in battle during World War II on May 29, 1999. Witek was born in Derby on December 10, 1921. Though he only lived in Derby for the first ten years of his life and later lived in Illinois, he considered Derby his home and listed it as such on his official military records. 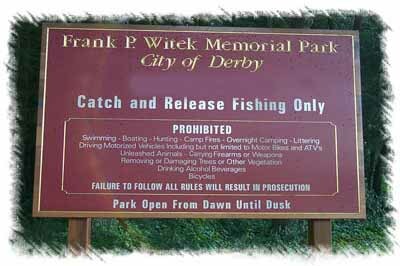 In taking the action, Mayor Marc Garofalo urged all Derby citizens to remember PFC Witek and all Derby veterans for their actions. Veteran groups in the community had brought PFC Witek's incredible story of gallantry in battle to the attention of city officials and urged them to honor him by naming the 144 acres of open space park land on the east side of town in honor of Witek. 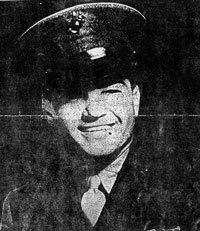 CITATION: For conspicuous gallantry and intrepidity at the risk of his life above and beyond the call of duty while serving with the 1st Battalion, Ninth Marines, Third Marine Division, during the Battle of Finegayan at Guam, Marianas, on 3 August 1944. When his rifle platoon was halted by heavy surprise fire from well camouflaged enemy positions, Private First Class Witek daringly remained standing to fire a full magazine from his automatic rifle at point-blank range into a depression housing Japanese troops, killing eight of the enemy and enabling the greater part of his platoon to take cover. During his platoon's withdrawal for consolidation of lines, he remained to safeguard a severely wounded comrade, courageously returning the enemy's fire until the arrival of stretcher bearers and then covering the evacuation by sustained fire as he moved backward toward his own lines. With his platoon again pinned down by a hostile machine gun, Private First Class Witek, on his own initiative, moved forward boldly ahead of the reinforcing tanks and infantry, alternately throwing hand grenades and firing as he advanced to within five to ten yards of the enemy position, destroying the hostile machine-gun emplacement and an additional eight Japanese before he himself was struck down by an enemy rifleman. His valiant and inspiring action effectively reduced the enemy's fire power, thereby enabling his platoon to attain its objective, and reflects the highest, credit upon Private First Class Witek and the United States Naval Service. He gallantly gave his life for his country. The city is also blessed with the Osbornedale State Park on the west side of town.